Have too many labels/categories on your post?Need a lot of space on your sidebar only for categories? There are many way to fix this problem. You can divide label become two or more , or use label cloud widget. An older version of Label widget, is only list type. As I said, this type need a lot of space. Label cloud become an alternative to simplify label display. Now you dont need to add any complicated script to get Label cloud. Blogger has installed cloud type for Label widget. Note: this is only text cloud not animated cloud widget. How to set label cloud on my template? Go to Page Element>Add Gadget, choose Labels gadget. There are two options, list type or cloud type to display. You also can choose which labels you want to show. Such a helpfull featured. same post. lol I got it for manda..
anyway, off topic. aren't you redirect your feed to feedburner? how come it doesn't affect your name on the following page and you got your feed subscriber count correct? :( I'm having problem with this, hope you can help. Everytime I redirect my feed, my name on blogs I'm following display page (blogger dashboard) changed and post images doesn't show.. :( It shows like this "posted by email address (name)"
@anna: yess, i have all in one google account XD . im sorry i have no idea about that..
do you make your templates (here) yourself? if you do can you make a very simple one for me? like white background and black text. nothing fancy. ternyata lebih gampang ya buat label cloud sekrang. thanks for this one! your the best! How do I get that or the animated cloud to work in your White Slider template? I did exactly as above, but it didn't change - it's still a list. I also have other specific questions about editing White Slider. Oooh! Thanks for this tip! 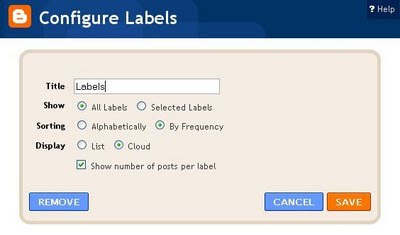 great tip, I was wondering the other night how to set label could on my iserve pharmacy blog, and I know now thanks buddy!